Hang onto your hat, we’re about to get a little freekeh! Freekeh is a beautiful ancient grain, full of beneficial nutrients. It is high in fiber, protein and calcium and it even has probiotic properties. Even though Freekeh has been around for many thousands of years, it is suddenly becoming one of the newest and most delicious super foods! 1. Heat a medium-size heavy saucepan over medium-high heat and add freekeh. Toast in the dry pan, shaking pan or stirring, until freekeh becomes fragrant, 2 to 3 minutes. Add 2 cups water and salt and bring to a boil. 2. Reduce heat to low, cover and simmer 20 to 25 minutes or until water has been absorbed. Turn off heat and uncover. Place a clean dish towel over the pot and return lid. Let sit at least 10 minutes. Uncover and allow freekeh to cool another 10 minutes. 3. 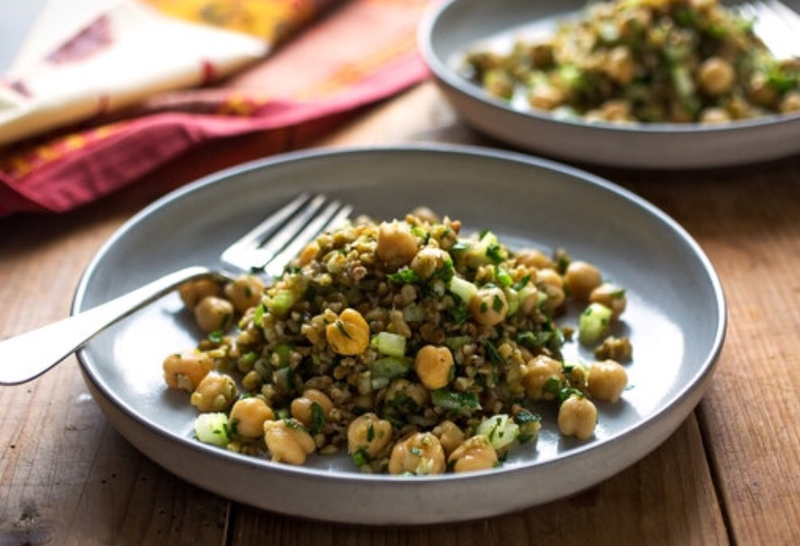 In a large bowl, combine freekeh, chopped herbs, celery, scallions and chickpeas and toss together. In a small bowl, whisk together lemon juice, cumin, garlic, salt and olive oil; toss with salad. Taste and add more lemon juice if desired. Serve right away or let sit for up to 1 hour before serving. * Preheat your oven to 375 degrees. * On a large baking sheet, toss the butternut squash cubes with the olive oil, kosher salt, black pepper and allspice. Use your hands to get them coated well. * Roast the squash in the oven for 18 to 20 minutes or until fork tender. Don’t over roast the cubes or they’ll become too mushy. When done, remove the baking sheet from the oven and set aside to cool. * Spread the pecans evenly on a small baking sheet. Shut the oven off, but while it’s still hot, place the pecans in and shut the door. Allow them to toast for 4 to 5 minutes. Remove and set aside to cool. * In a small bowl, combine the remaining ingredients up to the black pepper. Whisk together and set aside. 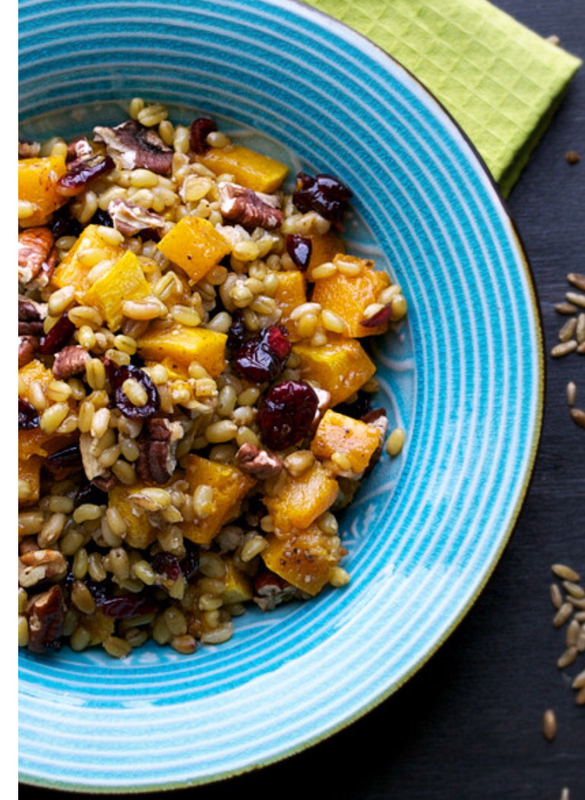 * In a large bowl, combine the freekeh and the cranberries. Toss with the dressing until completely coated. Now add the squash and pecans and toss lightly. Yummy and Fast Sunday Dinner.